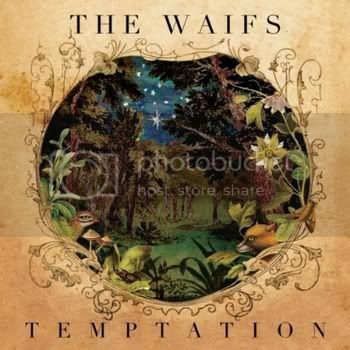 Although it’s a little late to be saying so, The Waifs may not be the best name for this band. I find myself expecting a soft acoustic sound, with conversational vocals and plucked, strummed and bowed instruments. In fact, there are many acoustic instruments here, with only an electric lead guitar that is used sparingly and electric bass on about half of the songs. But Temptation is a rootsy rock album in terms of sound. The two female singers, Donna Simpson and Vikki Thorn, are bluesy and soulful. Josh Cunningham, the male singer, is gruff and has a great old-time gospel voice. All three know their vocal skills well and write songs that show them to the best advantage. The rhythm section of David Ross MacDonald on drums and Ben Franz on electric and stand up bass propels the songs along and helps to provide that rock energy. Temptation is a rock album in all of the best ways, with passion that can smolder or burn, as the song requires. Donna Simpson and Vikki Thorn each contribute four songs to the album. Josh Cunningham has only three, but two of them are around seven minutes each, so the distribution is fair. Simpson starts things off with an astonishing slow burner called I Learn the Hard Way. Here, she sings in a smoky low alto over a slightly sinister slow groove. This is a tale of a woman on the precipice of committing more deeply to a relationship. Her past hurt wars with her present desire, and we do not learn which one wins. Elsewhere on the album, Simpson sings higher in her range, and the results are just as good. Notably, she also closes the album with Goodbye Darlin’. I would call this a breakup lullaby. That will sound strange until you hear both the sorrow and the tenderness in this song. It takes a special singer to pull this off, and Simpson does a wonderful job. Vikki Thorn is the soprano in the group. She has a delivery that reminds me of Rickie Lee Jones in all the right ways, with the same appealing mixture of sass and warmth. Beautiful Night is an unabashed love song with a groove that could have been created by Van Morrison, and Thorn puts the romanticism of this one over perfectly. Elsewhere, Thorn contributes Buffalo, an expression of one man’s hopes and dreams. Overall, Thorn as a writer displays a wonderful empathy for her characters, and her singing is completely convincing. Josh Cunningham contributes to amazing original gospel songs, Moses and the Lamb and the title track. Moses and the Lamb is a sermon about judgment day, while the title track has Jesus resisted the devil’s temptations. This kind of song can go wrong in so many ways, and it will come off sounding preachy. But Cunningham hits it exactly right. These songs come off as both tributes to classic blues-gospel artists, and as sincere declarations of faith. The blend of Cunningham’s lead vocals and Thorn and Simpson’s backup works beautifully. The band as a whole does a great job of driving these home. There are folk super groups, if you will, usually trios, who make albums that sound like song swaps. I enjoy these albums, as you know if you saw my recent review of Redbird. But I hope I haven’t made Temptation sound like one these albums. The Waifs are a working band that has been together for many years. Each of the three songwriters has a distinct identity, but the three musicians each support the others beautifully, and with an intuitiveness that comes from a long-term collaboration. None of the individual efforts here would be as strong outside of the context of the band. Here, they are strong indeed.